It’s been a real interesting couple of weeks for Apple and its extremely popular iOS mobile platform. The release of iOS 9.3 to an excitable public immediately after last month’s “Let us loop you in” event introduced new features like Night Shift mode into the lives of those with a compatible iPhone or iPad. It also instantly introduced a number of issues that affected different users in different ways, resulting in Apple almost immediately pushing out a public version of iOS 9.3.1 with some fixes and performance improvements included. 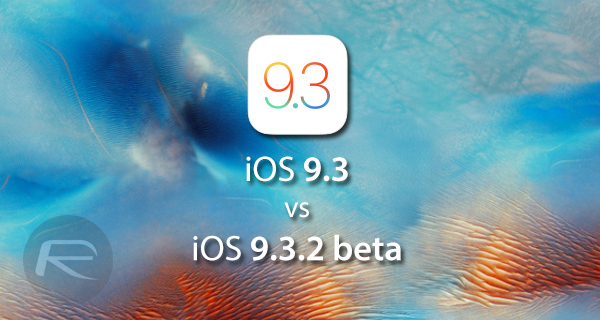 Now, as part of the progression of iOS leading into the unveiling of iOS 10, we also have an initial beta of 9.3.2 which has been tested across multiple devices for performance improvements. So how do the two version compare on supported devices? As is usually the case with companies like Apple, and something that is especially more prominent when we start getting into seeds like iOS 9.3.2 beta 1, this latest build of iOS that has been issued to developers looks to contain minimal outward-facing changes or feature additions. In fact, it seems as if it would take the extremely keen eyed individual to find any visual or noticeable changes at all. The accompanying developer notes even suggest that this is nothing more than a bunch of internal improvements. Well, some of us would like to see the results for ourselves, and that’s exactly what we can see in this series of videos which compares iOS 9.3.1 with iOS 9.3.2 beta 1 running on the iPhone 4s (32GB), iPhone 5 (16GB), iPhone 5s (16GB), and the Phone 6 (64GB). As is usually the case with these types of videos, it’s extremely important that each device involved is set up in the same way. Given the fact that each firmware version is being tested across multiple devices that differ in hardware, it’s important to get each device as equal as possible from a set up perspective. To that end, each iPhone used was restored to a stock version of the firmware, loaded with exactly the same backup. The test included the usual bootup, lots of app switching, loading web pages, and a Geekbench 3 run to get a better understanding of the difference in performance across the two firmware versions. The tests show that Apple has definitely made some improvements – albiet small ones – with the release of iOS 9.3.2 beta 1, with some interesting and positive outcomes for those with relatively modern hardware. iPhone 5 and iPhone 6 owners can expect to benefit from faster boot times when finally getting their hands on iOS 9.3.2. As for the iPhone 5s, it was a surprising tie. Overall, the performance gain on the iPhone 5/5s and iPhone 6 was negligible at best including the Geekbench scores which were roughly the same. It shouldn’t really come as a surprise that Apple hasn’t been able to extract any performance improvement out of the older iPhone 4s which even booted slower on the beta release. We can definitely expect that the unveiling of iOS 10 will effectively kill support for the last remaining 3.5-inch device. Take a look at the video comparisons for yourself and see what you think.